As network speeds increase, so does the importance of the light loss on your key fibre links. Scroll down to read more about the different ways of testing fibre. Having dirty fibre is a major contributor to poor connections. In fact cleaning your fibre end-faces can reduce light loss by more than 1dB and increase performance on fibre links for relatively little expense or effort. Using canned air, finger ends or shirt sleeves are not appropriate for the removal of dust and oil particles that can build up...and can make it worse! An appropriate Fibre Cleaning Kit contains many different types of cleaning options from alcohol based cleaning wipes, which clean the ends and dry in the air, through to dry cleaning methods, all designed to leave a clean surface for the connection. Take a look at Cleaning Kits. Mating contaminated connectors can cause permanent damage as microscopic debris is crushed between end-faces in physical contact. Even factory terminated patch cords or pigtails must be inspected as protective caps do not keep end-faces clean. Avoiding this common cause of failure, starts with inspecting the end-face and eliminating any contamination before insertion into a bulkhead or piece of equipment. Video microscopes incorporate both an optical probe and a display for viewing the probe’s image. Probes are designed to be small so that they can reach ports in hard-to-access places. The screens allow images to be expanded for easier identification of contaminants and damage. 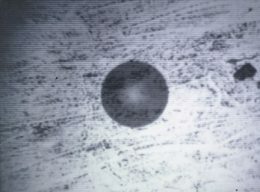 Because the end-face is viewed on a screen instead of directly, probes eliminate any chance of harmful laser light from reaching a person’s eye. In addition, automated PASS/FAIL certification take the guess work out of fibre inspection so anyone can be a fibre expert. 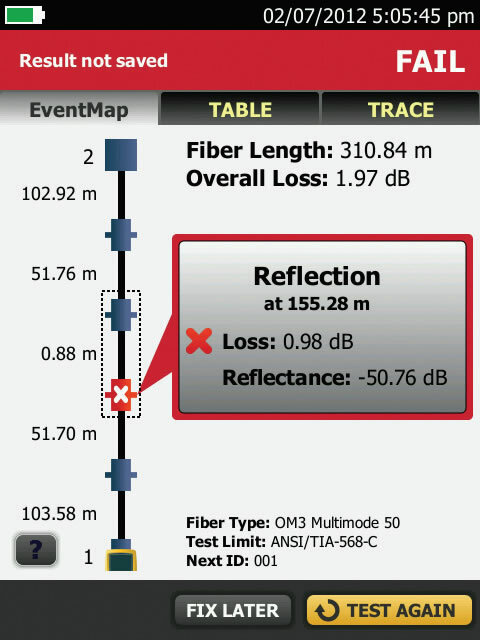 Take a look at Fluke Networks FiberInspector Pro. The first step in verifying your fibre cabling is to perform a simple light loss measurement, this can be done using a light source and power meter test set. Having created a baseline reference, the source can be placed on one end of the fibre and the meter unit on the other. 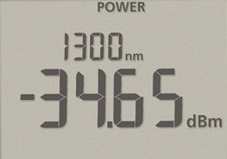 Light is sent down the fibre and measurement of the total amount of light lost over the fibre recorded. There are fibre standards that specify the limits of acceptable loss across a fibre taking into account splices, joins and the total length, so from these measurements it is possible to calculate whether the reading you have is a Pass or Fail. Take a look at the SimpliFiber PRO FTK kits. Certification of fibres against the industry standards is known as Basic or Tier 1 Certification. The standards state budgetary figures for light lost for each joint, splice and the total attenuation (loss inside the fibre) across the fibre. It also requires you to obtain a length measurement and test both the Transmit and Receive at the same time. Therefore the standard is based on the fact that you know how many joins are in the link you wish to test and you use a correct reference measurement (usually a known or trusted patch lead). Don’t worry if this is what you are looking for the CertiFiber Pro is designed specifically to make all of this simple and easy to perform, a self-guiding GUI and a one touch technology makes certifying fibre simple and fast! 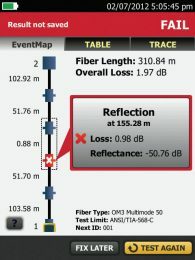 There is also an Extended or Tier 2 Certification test, which states that the performance of every splice and patch should be measured individually and links can be failed if one of these events is out of specification, even if the budget loss for the whole link is OK. To perform these tests you need a full OTDR unit on top of the CertiFibre – see the next section. If you aren’t an installer but would like to know why a fibre link performs badly or if it's even broken then an OTDR or Optical Time Domain Reflectometer is the tool for you! The OTDR launches very bright light into the fibre and looks for reflection and loss events along its length, such as splices, joints or even bends and breaks. By measuring how long reflections take to come back and the signature of the reflection they can measure the distance to a break, a single joint that is letting the link down, a bad splice or a sharp bend that is obstructing the light. They can measure these events at a precise distance and as a result private network owners find them very useful when solving issues. Sounds complicated right? ... actually no, Fluke Networks OptiFiber Pro is a plug and test tool, that allows you to gain information such as the image shown by simply plugging in and pressing test. There is NO setting up, you don’t even need to understand OTDR technology. 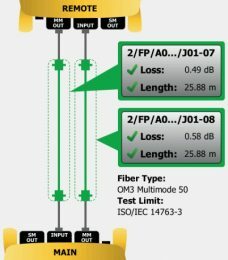 Take a closer look at Fluke Networks OptiFiber Pro. 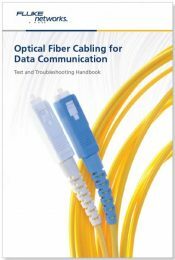 Why not request your free, printed copy of the "Fiber Test & Troubleshooting Handbook" from Fluke Networks? This comprehensive, 44-page handbook is a how-to resource handbook for anyone involved in the installation or maintenance of fibre cabling infrastructure. It covers the fundamentals of how to inspect and clean, test, troubleshoot and document fibre cabling infrastructure installations. Plus includes many best practices and screenshots documenting typical work flows.